EXPI– Real Estate Brokerage firm we identified as likely to triple or more in value in 12-18 months. Already moving much higher and now uplisted to the NASDAQ which we advised was likely 6 months prior! 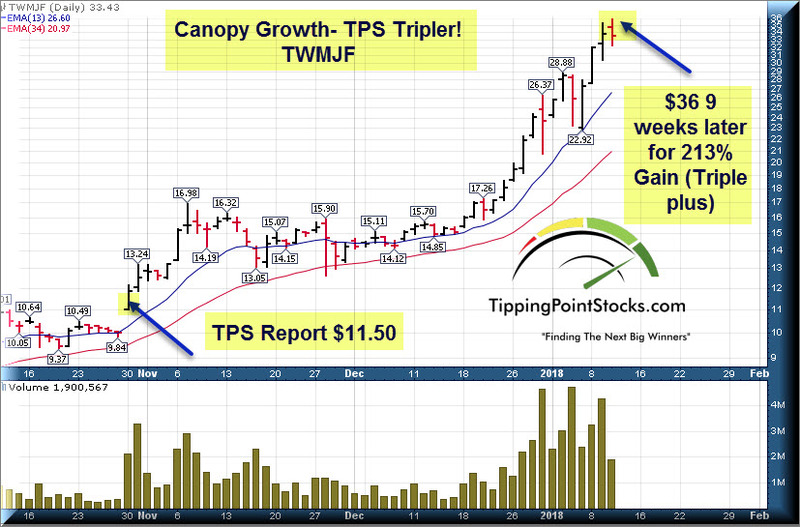 Canopy Growth (TWMJF or WEED.TO) October 30th report at $11.50. The stock reached a high over $36 9 weeks later for a 213% gain. A $10,000 Position would have paid for 13 years of TPS subscription. 170%, 200%, 600%, 150% gainers! Written up for TPS Members in November 2017 at $6.44 per share. As of May 16th 2018 the stock was 17.30 for a 170% gain! Straight Path Communications (STRP)– We wrote up this spin off from IDT in July of 2015 when nobody had heard of them. They were holding 5G assets that we felt were undervalued like cheap real estate. The company was the subject of a bidding war in May of 2017 and Verizon bought them out for $185 per share. The report was issued at $28 per share, resulting in a 600% Gain. TelaDoc- TDOC- We wrote this company up weeks after their IPO at $19.50 per share in 2017. This company specializes in providing healthcare visits via Telephone and or Internet. Our opinion was they were the leaders in a new revolution in cost savings and patient care and that their network of subscribers would make investors rich. As of May 2018 the stock is trading at $49 per share. This stock is up 152% as of May 15th 2018. This material should not be considered investment advice. The Market Analysts Group, LLC, TippingPointStocks.com, Stockreversalspremium.com , StockReversals.com and or any of our affiliates are not a registered investment advisor. Under no circumstances should any content from this website, articles, videos, seminars or emails from TippingPointStocks.com, Stockreversals.com or Stockreversalspremium.com or any of its affiliates be used or interpreted as a recommendation to buy or sell any type of security or commodity contract. This material is not a solicitation for a trading approach to financial markets. Any investment decisions must in all cases be made by the reader or by his or her registered investment advisor. This information is for educational purposes only. Disclaimer: CFTC RULE 4.41 – HYPOTHETICAL OR SIMULATED PERFORMANCE RESULTS HAVE CERTAIN LIMITATIONS. UNLIKE AN ACTUAL PERFORMANCE RECORD, SIMULATED RESULTS DO NOT REPRESENT ACTUAL TRADING. ALSO, SINCE THE TRADES HAVE NOT BEEN EXECUTED, THE RESULTS MAY HAVE UNDER-OR-OVER COMPENSATED FOR THE IMPACT, IF ANY, OF CERTAIN MARKET FACTORS, SUCH AS LACK OF LIQUIDITY. SIMULATED TRADING PROGRAMS IN GENERAL ARE ALSO SUBJECT TO THE FACT THAT THEY ARE DESIGNED WITH THE BENEFIT OF HINDSIGHT. NO REPRESENTATION IS BEING MADE THAT ANY ACCOUNT WILL OR IS LIKELY TO ACHIEVE PROFIT OR LOSSES SIMILAR TO THOSE SHOWN.